— From La 134, head south on La 17. Go 8.8 miles to Poverty Point Parkway at Poverty Point Reservoir State Park; turn left. Go 0.3 mile to pull-off; marker is on right. 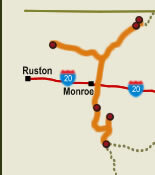 — From US 80, head north on La 17. Go 1.7 miles to Poverty Point Parkway at Poverty Point Reservoir State Park; turn right. Go 0.3 mile to pull-off; marker is on right. Marsden is a group of five mounds and parts of an earthen embankment. Unlike most of the other sites on the Mounds Trail, it is open to the public and is accessible by foot. Four of the mounds (Md. A–Md. D) are along the east edge of Maçon Ridge, and the embankment apparently connects three of them. The largest mound (Md. E) and another portion of the embankment are in a wooded area about 300 feet to the southwest; it’s a 13-foot-tall platform mound, measuring 150 feet square at its base and about 130 feet square at the summit. The other mounds are only 3 to 5 feet tall. 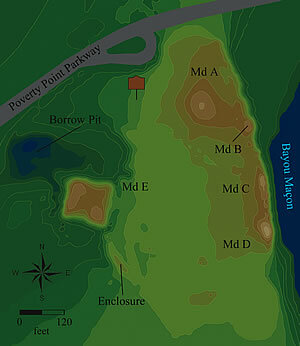 Poverty Point period artifacts found under the mounds suggest that people lived here as early as 1500 BC. Charcoal from a hearth under one of the smaller mounds dates to between AD 400 and AD 1200 (Troyville/Coles Creek periods). For more information about visiting Poverty Point Reservoir State Park, where Marsden Mounds are located, click here.